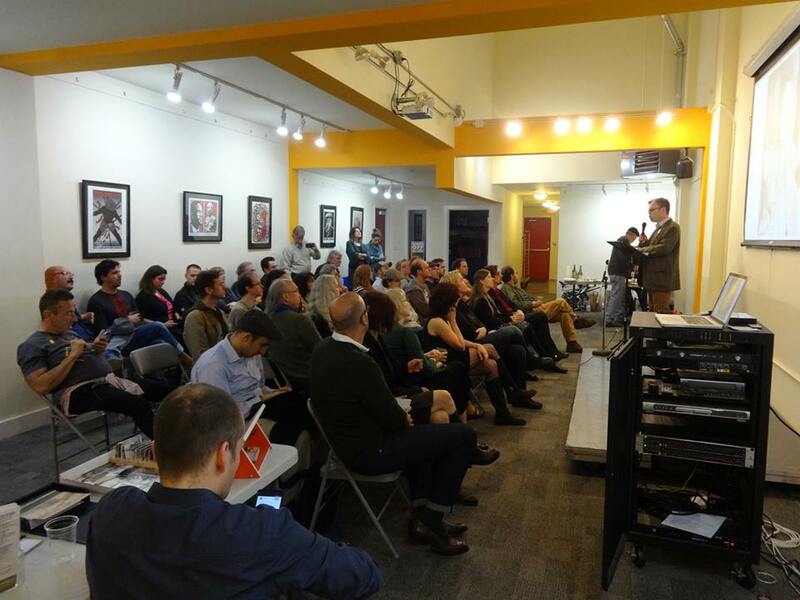 Scene from The Emperor’s 197th Birthday: A Party & Presentation of Recent Findings, an event the Campaign held on 3 February 2015 at the 518 Valencia gallery/event space. Since launching in September 2013, The Emperor's Bridge Campaign has been engaged in conducting, publishing and presenting deep, original, primary-source-driven research on Emperor Norton. We now are the leading public resource on the Emperor. As part of our mission, the Campaign offers to our members and the public a regular series of talks and walks about different aspects of the life and legacy of Emperor Norton. Does your organization offer lectures/talks, walks and the like as part of its programming? Does your board invite guest speakers to address its meetings and retreats? Why not invite The Emperor’s Bridge Campaign to provide your group with a unique and entertaining learning experience? a shorter 15-, 20- or 30-minute segment, with or without slides. We also can lead a Field Talk — a site-specific “walk without the walk” that enables attendees to visit Emperor-significant places and learn why they matter in much greater detail than a standard walking tour can provide. These talks generally run from 45 minutes to an hour. If you’d like to propose some rarefied subject for a talk or walk on Emperor Norton, chances are we’ve looked into it! — even if we’ve yet to write it up or produce an event on it. We love to answer questions about the Emperor — and are happy to build in a Q&A to our talk or walk. To discuss programming and fee/honorarium options — and to get your organization on our calendar — drop us a line here.